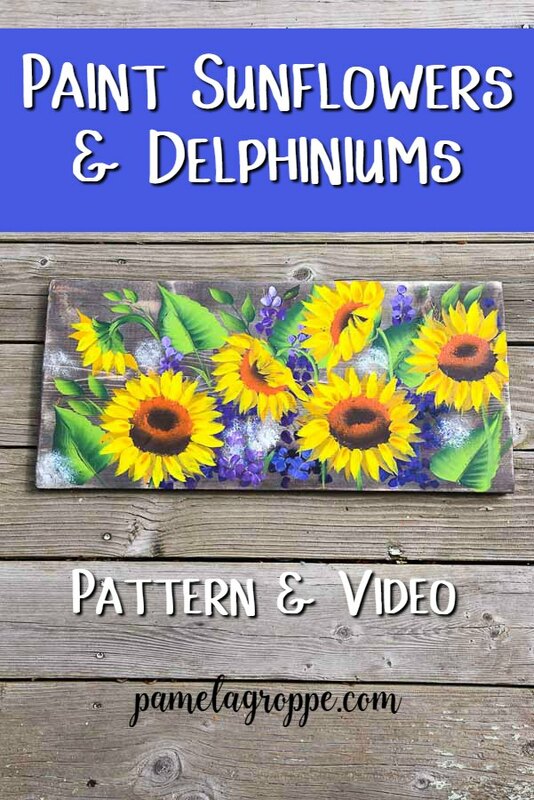 Create a beautiful painting of sunflowers and delphiniums. Step by step video instructions along with a printable pattern. Paint this design on wood for a DIY rustic sign, or paint them on a canvas for unique wall art. 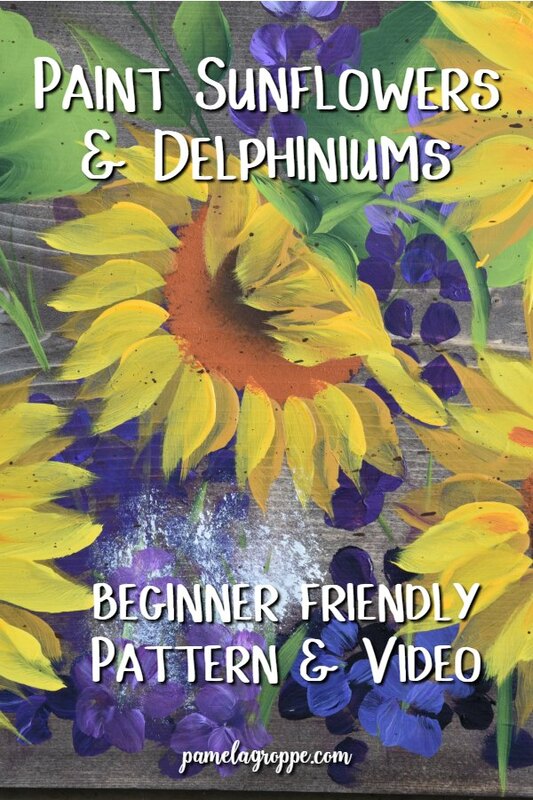 When you paint sunflowers and delphiniums together you get some eye popping art with the complimentary colors. I tried to keep this one looser and more impressionistic. 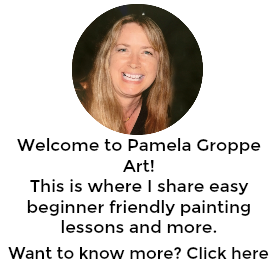 I know you will love this new workshop I have ready for you. 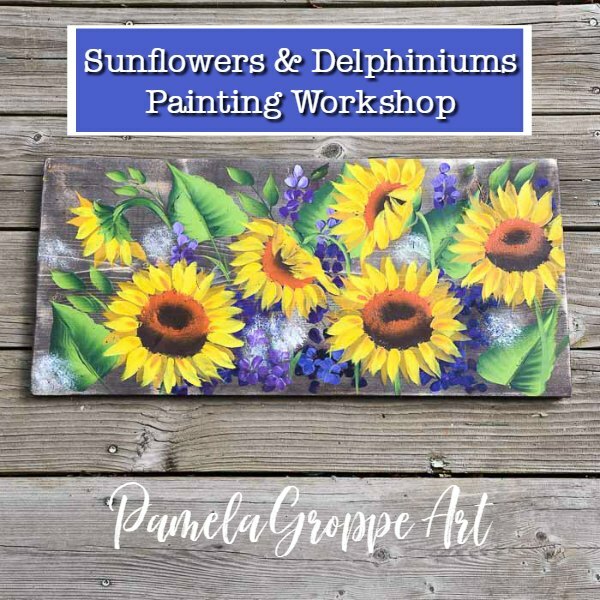 This workshop will teach you how to paint these Sunflowers and Delphiniums on a wood board to make a sign or rustic painting. 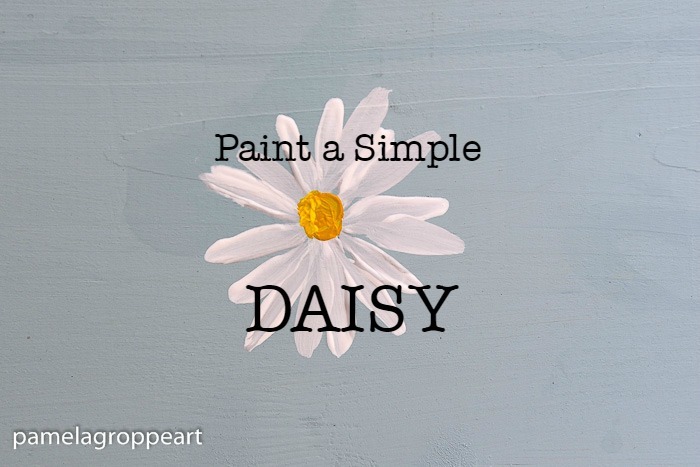 You are certainly welcome to paint it on a canvas and add other flowers you may have learned here at Pamela Groppe Art. Personally, I think simple daisies would look really sweet added to this. Just a few to really add a pop of white. I shared a sample video on YouTube of my practice for this and it was a hit so I know creating a step by step video tutorial was needed. The step by step workshop is painted larger than the practice piece above but you can scale it as you wish. I also used some alternate colors I preferred for a more vibrant painting. Included in the workshop is a printable pattern and supply list so you can re-create this exact design. Each video is downloadable so if you have limited internet and find streaming difficult it is easier to view the lessons. Download once and play over and over again without any data usage. These are for personal use only and I would appreciate them not being shared. Each video is under 20 minutes long and easily breaks down each step. If you don’t want the entire workshop but would like just the printable pattern to trace you can find it here. No photo step by step or other instructions are with it, just the pattern to print and a supply list. The post below will give you some helpful to refer to. 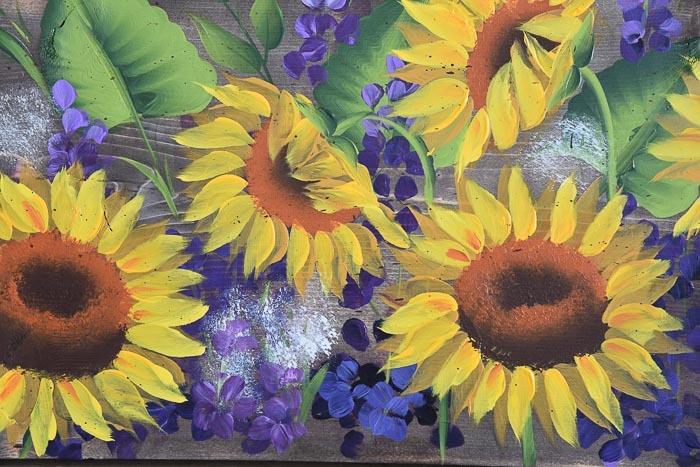 For a step by step tutorial for Sunflowers visit this post. Coming up soon on the site, some more helpful tips and tricks for creating fun paintings with a rustic vibe and fun garden signs! 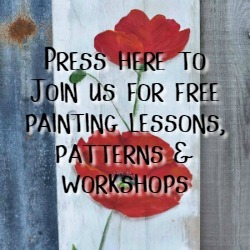 Want to check out more of my workshops? Thank you all for your support. 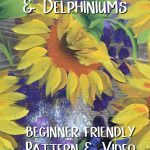 All your purchases help me keep my free tutorials coming.